In a hurry? Skip down to the Summary. I greatly appreciate R. Scott Clark’s zeal for the gospel and his defense of sola fide. However, he has a reputation for not accurately representing the nuances of various theological disagreements and for silencing those he disagrees with. Reformed paedobaptists who disagree with Clark on a variety of different topics have all complained about this. This leads to a fair amount of problems as Clark has become somewhat of a popularizer of reformed theology. People are led to believe things are much simpler than they actually are. 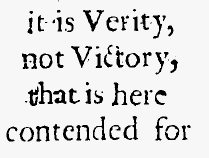 The latest issue to come under his sights is 1689 Federalism. He significantly misrepresented the view in his main point of criticism. I attempted to add a comment of clarification on his blog, but it was not approved. So I wrote a post explaining how Clark has misrepresented 1689 Federalism. Other people began commenting on his blog asking for him to interact with what I had said. Both comments were deleted without any response. He eventually responded (sort of) on Twitter. I say “sort of” because 1) He refused to say where the quote was from or link to the blog, and 2) He isolated the quote from the rest of the correction and clarification as to what the quote meant. Thus once I corrected him, he chose to ignore me and merely perpetuate his misrepresentation. He posted the same comment on his blog. Again, he quotes me anonymously without linking to or mentioning the source so that people can read it in context for themselves. Furthermore, he isolates one statement that he can continue to twist to fit his straw man, while ignoring the explanation as to what that statement means, in contrast to what he misrepresents it as meaning in his post. So no, it is not a concise statement of the view he rejected in his post. It is a concise statement of the view that he misrepresented in his post. No doubt, he will still reject the view once it is properly represented, but for some strange reason he refuses to allow it to be. As one person noted, this has become quite petty. Why has Clark gone to such lengths to hide my response from his followers/readers? It may simply be a matter of Clark’s professorial preference for monologue leaking over into his blog. I assume he is no fan of the Socratic method. But this is no way for a professor to model scholarship to his students. It may also be the case that Clark has decided that 1689 Federalism just doesn’t know what it is talking about, so to protect his followers/readers from confusion, he simply will not allow us to dialogue and will delete comments he doesn’t want people to see. But there may be a bigger reason. Clark is adamant in his post that 1689 Federalism is in no way Reformed. “My job here is to help Reformed folk understand what we confess. 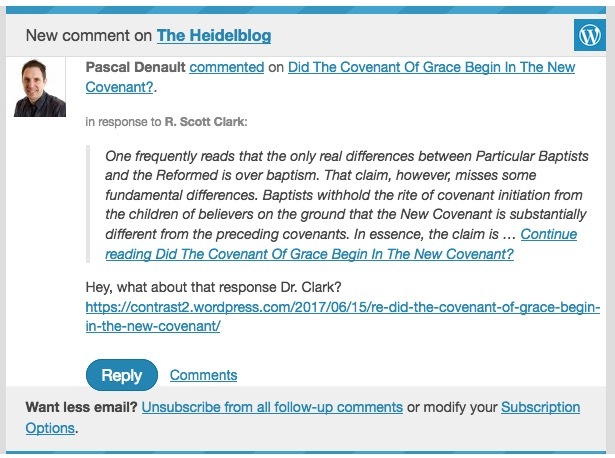 Here I’m doing it by way of contrast.” But there are Reformed critics of Clark who are just as adamant that Clark is in no way Reformed in his covenant theology. That’s a point that I discussed in my reply to Clark. In a 2007 series on Republication, Clark very clearly articulated the subservient covenant view as his own. It’s hard to state the subservient view any clearer than that. The Abrahamic and Mosaic Covenants are two different, distinct covenants. The Abrahamic Covenant is the Covenant of Grace through which people are saved (now and during the time of Moses). The Mosaic Covenant is not. That may apply to WCF full-subscriptionists, but to the rest of us confessionalists, there is no conflict… What I mean is that I fully subscribe the Three Forms of Unity as a minister in the URCNA and, for the most part, follow Owen’s view of the MC. I don’t see how those two things are in conflict. I don’t know if particular presbyteries in the OP or PCA would allow a minister to take Owen’s view as an exception. I suspect that many would allow it, if it were qualified and explained. Keep in mind that Owen’s concern is to show that the MC cannot be REDUCED to a mere admin of the CoG. He is concerned to show that, because the MC is a distinct covenant from the Abrahamic, one cannot flatten out the contours of redemptive history in the interest of showing continuity in the Bible. As I explained in my reply to Clark, presbyterians have been drilling in on this issue, resulting in the recent OPC GA Study Committee on Republication, which states very clearly that Clark’s view is contrary to the WCF. [P]roponents of the subservient covenant view did not view themselves as advocating a version of View 4 outlined below (i.e., that the Mosaic covenant is in substance a covenant of grace with a unique administration)… [View 4] is affirmed by the Westminster Confession of Faith. WCF 7.5–6… The most extensive criticism of the position comes from the works of John Owen and Samuel Bolton… It is difficult to harmonize this [subservient covenant] view with the confessional affirmations (outlined above) regarding the Sinai covenant as being in substance and kind a covenant of grace. In other words, my reply threw a wrench in Clark’s narrative. Reformed covenant theology is not as black and white as he likes to make it. It is considerably more complex. Recognizing that complexity has at least two effects. 1) It reveals that Clark’s view is contrary to the WCF. 2) It reveals that 1689 Federalism is part of that complex reformed dialogue on covenant theology. As Sam Renihan said in the article Clark was responding to “Where Reformed covenant theology was united, the Particular Baptists were united with them. Where Reformed covenant theology was diverse, the Particular Baptists lived within that diversity.” These are substantial issues that Clark would prefer not to have his readers wrestle with. Far better to keep it hidden from them. Returning to Clark’s 2007 series on Republication, he appealed to Charles Hodge to make a very significant point about the dichotomous nature of the Abrahamic Covenant. How these views–of Hodge in particular–don’t surrender the fort to the baptists, I don’t see… Now the question is: how will it be addressed by Kline’s devotes?… I think I would be happy to understand exactly how the baptist gains no ground thereby… It’s confusing trying to answer a baptist who looks at you with a straight face and says, “If YOU only understood covenant theology, you’d realize I’m right. What don’t you understand about the eschatological prologue and intrusion ethics? I don’t have time to explain covenant theology to presbyterian beginners.” These days are already upon us. In response, Clark doubled-down on the Abrahamic dichotomy. 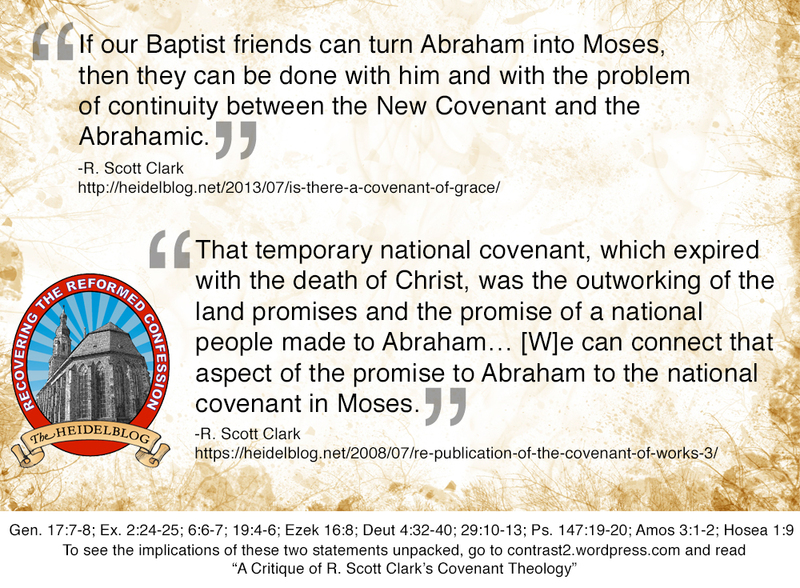 Note that Clark typically says baptists err by “turning Abraham into Moses.” Yet here he acknowledges that the national, temporary, typological Old Covenant was rooted in God’s promise to Abraham. See my extended comments here. Clark is caught between a rock and a hard place. He understands that properly recognizing the Mosaic Covenant as a typological covenant of works for life in the land of Canaan is essential to defending sola fide. 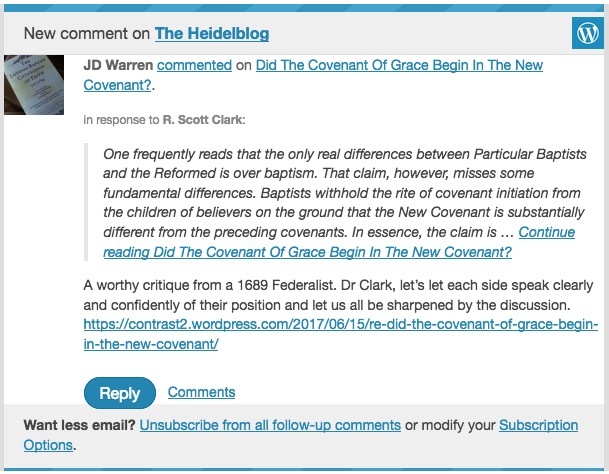 But, as I have shown in a full-length critique of Clark’s covenant theology, his adoption of the subservient covenant view leads directly to 1689 Federalism. He has no defense against it. Perhaps that is why he insists on misrepresenting 1689 Federalism and keeping this blog hidden from his readers.